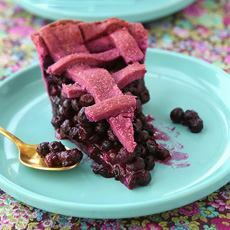  and  Have some fun with your pie crusts (photo courtesy Dulce Delight). You can make the crust in different colors (photo courtesy Balducci’s). Vermont Creamery’s European-Style Butter has 86% butterfat, compared to 80% with most supermarket brands (photo courtesy Good Eggs). We came across this purple crust on the website of Vermont Creamery, producers of some of the most splendid goat cheese and butter on earth. The colored crust, by Raiza Costa of the Dulce Delight online video series, is a “first” for us, excepting green bagels and donuts for St. Patrick’s Day and some very festive rainbow churros for Pride Week. The crust becomes purple by adding food color to the water used to make the dough; the dough is made in a food processor. A food processor breaks up the cold butter more quickly and evenly. 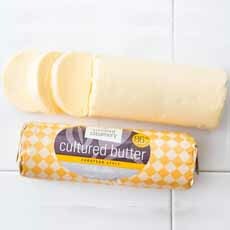 Raiza also recommends the highest-fat butter possible, and uses the 86% fat cultured butter from Vermont Creamery. Raiza uses her own homemade food color; here’s her article on how to make different food colors. But you can use a commercial food color like McCormick’s, in a proportion of 10 drops red to 5 drops blue; or a purple paste/gel. To thicken a fruit filling, Raiza prefers potato starch over flour or cornstarch. *Look for European Style butter, such as the 86% cultured butter from Vermont Creamery. Commercial butter in the U.S. is 80%. More fat means creamier mouthfeel and moister crust. 1. MIX the flour, sugar and salt and add to a food processor. 2. ADD the butter and pulse one second at a time until you see crumbs the size of the pea; stop processing. 4. MAKE the filling. 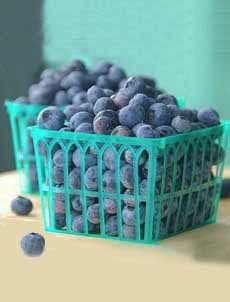 Combine the blueberries, sugar and spices in a large bowl with the lemon juice and zest; blend and then stir in the potato starch. 5. PREPARE the lattice top on a parchment sheet. Spank the dough, then roll out to a 10″ round for a 9″ pie pan. Cut into even stripes with a ruler. LIFT every other stripe, then place the alternative stripes horizontally, threading them in and out (see the video). You can do this ahead of time and freeze the lattice until you need it. It keeps its shape when place it on top of the pie and peel off the parchment. 6. ROLL the bottom crust over a rolling pin and roll it out over the pie plate; try not to use too much flour. Carefully pat down the bottom and sides. Add the filling and cover with pats of butter. 7. LAY the lattice over the filling and butter pats, and roll the edges of the bottom crust to crimp together with the top crust. Refrigerate. 8. PREHEAT the oven to 500°F. Place the pie on the bottom rack and lower the heat to 425°F. 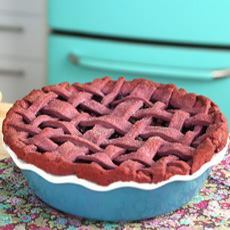 Once the crust gets golden brown which is hard to see on a purple crust), lower the heat to 327°F and bake approximately 35 minutes until the filling bubbles.